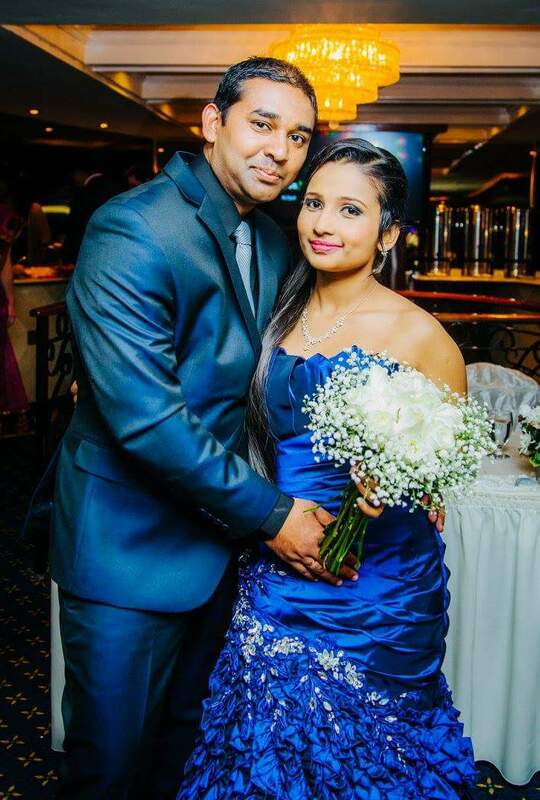 “SRI LANKAN weddings are filled with rituals and customs passed on from generations. 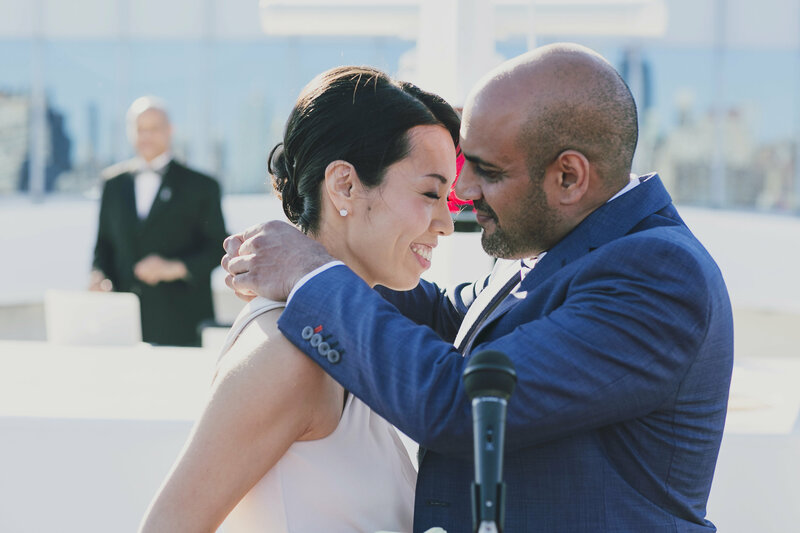 Our wedding was a traditional wedding with a modern twist. All the auspicious events take place in order to bless the couple with eternal bliss. Before the couple leaves the house, they drink a glass of water with white jasmine Flowers in it as a symbol of luck. Normally the couple and the group is escorted to the ceremonial hall by Sri Lankan traditional drummers and dancers. Since we are Catholic, we did not have the pooruwa ceremony. 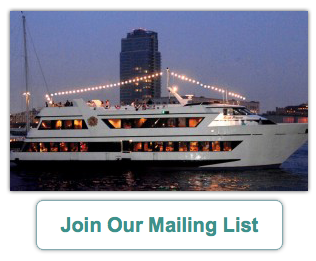 Instead we had the church ceremony and the reception aboard the yacht. 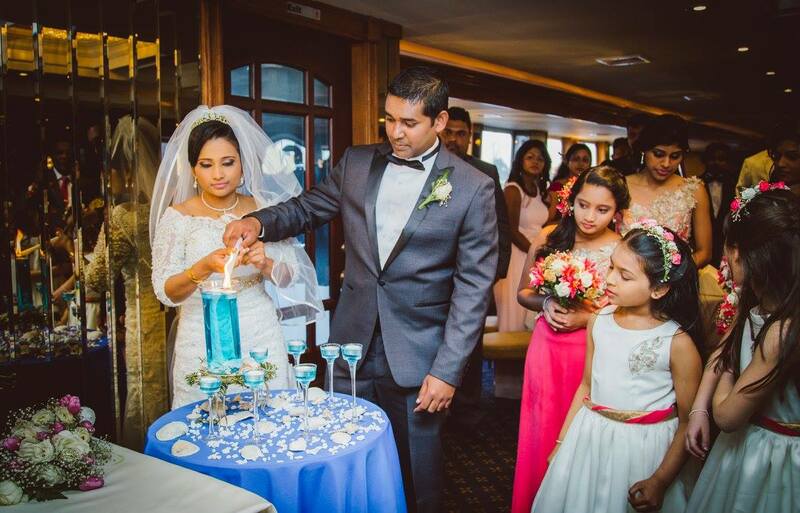 Next, the couple and the parents light the oil lamp which signify the start of a bright new future together. Then the couple cut the wedding cake structure and distribute traditional Sri Lankan wedding cake in a specially box which is designed according to the wedding theme. We had a sea theme so our wedding cake box was a seashell. 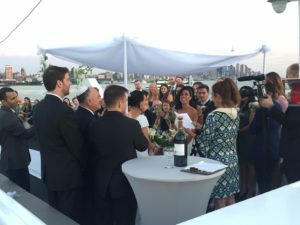 Two immediate family members from both sides give a speech and toast for a happy life for the couple. Then the guests greet the couple and the party begins. We served traditional Sri Lankan dinner and desserts including Eggplant Moju, Milk Rice, Malay pickle, Symbol, Watalappan and more. 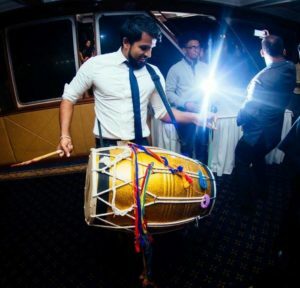 Baila dancing also accompanied by traditional drummers is well famous in a Sri Lankan wedding. The bride and the groom change their clothes into colorful attire before they leave the wedding reception. 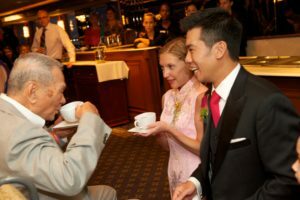 In many Asian cultures, a formal tea ceremony plays an important role in celebrating an engagement and honoring the bride and groom’s families during the wedding festivities. 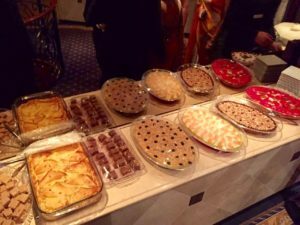 These ancient traditions are steeped in elaborate rituals that are often accompanied by toasts, prayers and gifts. 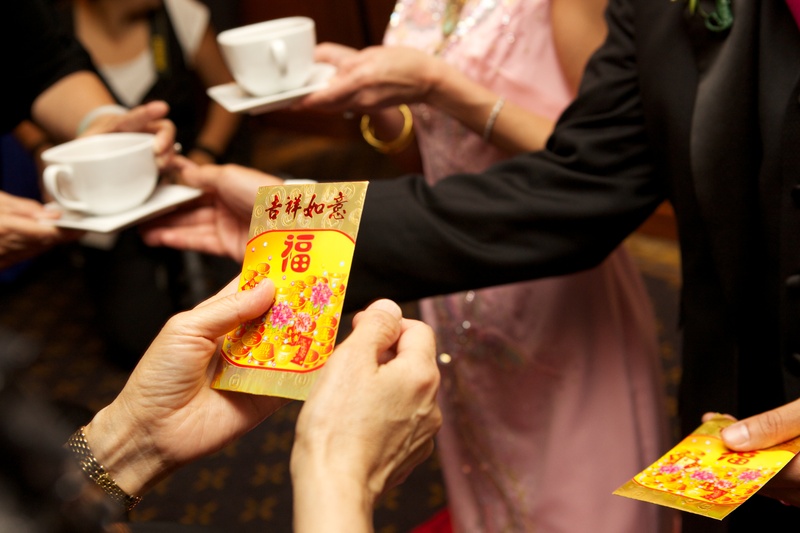 The Chinese Wedding Tea Ceremony is a tradition in which couples getting married show respect to their parents. 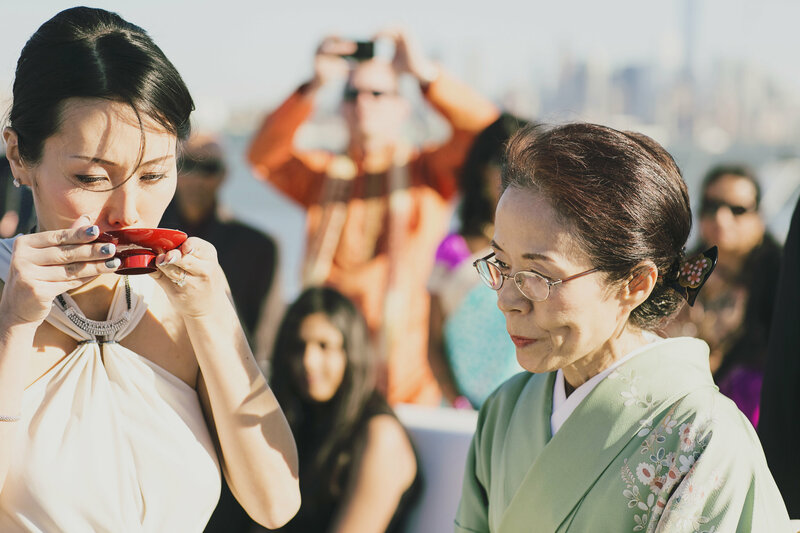 The bride usually prepares the tea and along with the groom, they serve it to their elders. People drinking the tea will sit and the bride and groom will kneel in front of them to serve tea. 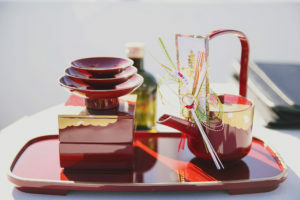 The couple will often receive gifts during the ceremony as well. 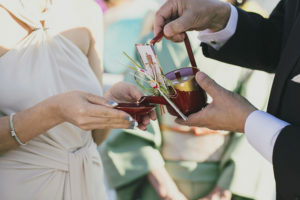 The ocha ceremony is also an important ritual in Japanese weddings. The elaborate preparation and presentation of the strong green tea is viewed as a transformative, spiritual ritual that binds the newlyweds for life. 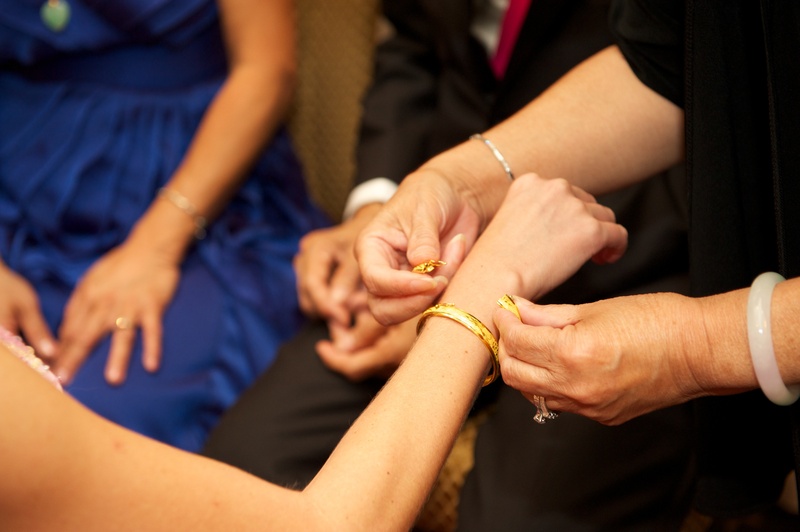 The groom offers the bride lifelong protection by placing a mangalsutra, or sacred necklace made of black and gold beads, around her neck and applying sindoor (red vermillion powder) on the crown of her forehead. These two offerings signify the bride’s status as a married woman and the grooms devotion to the bride. 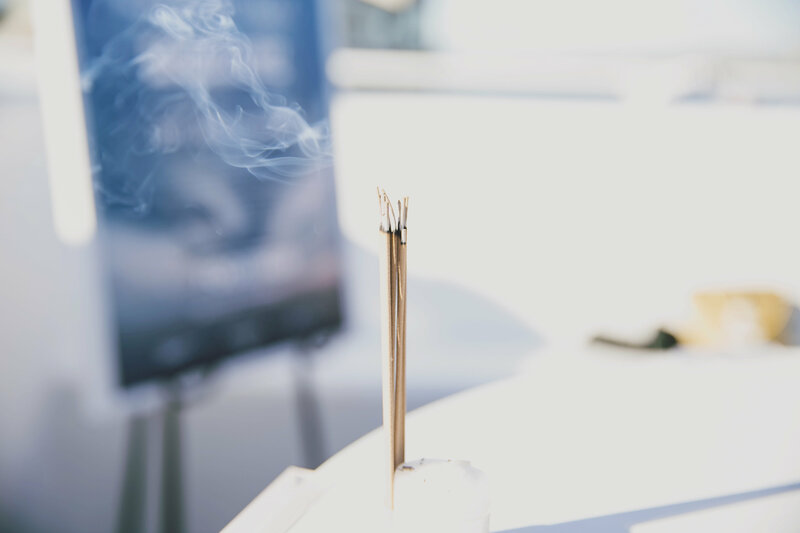 prayers, and other forms of worship. As part of the daily ritual worship within the Hindu tradition, incense is offered to God (usually by rotating the sticks thrice in a clockwise direction) in His deity forms, such as Krishna and Rama. 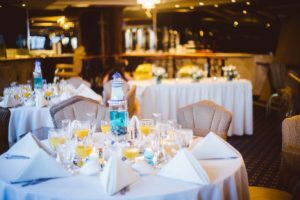 A traditional Jewish wedding is full of meaningful rituals, symbolizing the beauty of the relationship between two individuals, as well as their obligations to each other and to the Jewish people. A “Chuppa” in Hebrew literally means “canopy” or “covering”. 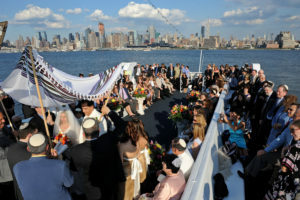 A Jewish wedding ceremony typically occurs under a chuppah, which has four open sides. What you wear at your wedding can be very important. 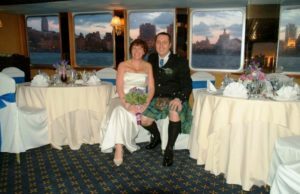 One of the most unique ways to bring the spirit of the Celts into your wedding is to have the men and boys in your wedding party dress in authentic kilts. 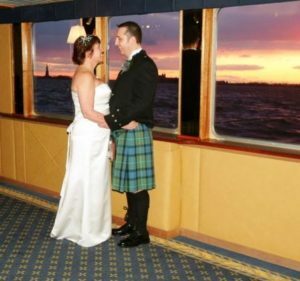 To see your men dressed in full regalia of formal kilt attire is truly spectacular. We enjoyed seeing one of our grooms in his traditional kilt aboard Royal Princess for one of our weddings. So, what are your traditions? What is important to you and what is not so important? 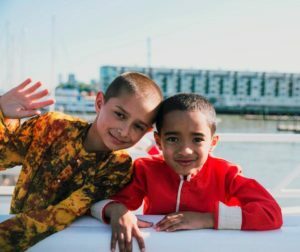 What is universal and what is unique?